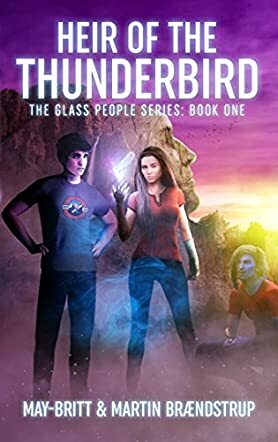 In Heir of the Thunderbird (The Glass People, Book 1) by Martin and May-Britt Brændstrup, 16-year-old Victoria is a very fragile teenager, dubbed as ‘the girl made of glass’ by her peers. Her bones snap at the slightest strain. Victoria’s condition and her Passamaquoddy Indian heritage from her father’s side isolated her from other teens. Her diary entries made it easier for me to get to know the young character. She wrote about her broken bones, her best friend, Beate, her father, about being different due to her condition and her looks, and her desire to just be normal and be part of the crowd. In a sense, Victoria is a typical teenager, that is until she discovers more about her heritage and the secret organization that has been watching her the whole time. The story is quite informative about the Passamaquoddy people, their folklore, and legends that are incorporated nicely into the story premise. Some parts need more ‘show, don’t tell’ but, overall, the narrative is clear and the story is well-paced. The direction of the plot was not quite what I expected. The turn of events in Chapter 3, The Mad Doctor, was somewhat bizarre. I questioned Victoria’s rationality when she decided to call the freaky doctor again, but it was also a key point for the protagonist’s next decision. Although intended for YA readers, I really enjoyed this supernatural coming-of-age story. Heir of the Thunderbird is an easy and intriguing read and a solid debut for the series.